Bienvenido! Greetings from the M/Y Coral in the Galápagos Islands! To celebrate the aquarium’s 20th anniversary, I’m visiting the Islands with a group of members and supporters. I’m writing this post after a truly spectacular day spent exploring Española Island. Words can’t begin to describe the amazing biodiversity of this incredible place. According to our naturalist guides, Española is the oldest island in Galápagos. Every step I took along this rocky outpost was a constant reminder that this island was formed several million years ago by volcanic activity. 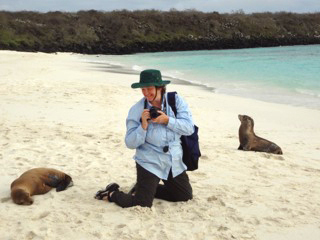 Birch Aquarium Executive Director Nigella Hillgarth observes a mother sea lion and her pup on Española Island in the Galápagos. The morning began with a walk along the beach to view the sea lions’ nesting area. 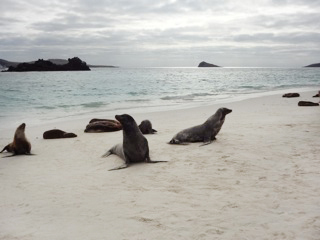 Here, south of the equator, it’s springtime and there were many sea lions nursing with their mothers. Our naturalist for the day, Alejandro, explained that mothers’ begin teaching their babies the sound of their bark from almost the moment they are born. This allows the mothers to leave their babies so they can go into the water and feed. The mother and baby will call back and forth to find each other again, so that the cycle of nursing and feeding can continue. Mother and baby sea lion on Española Island in the Galápagos. 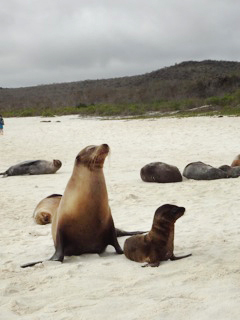 Sea lions on Española Island in the Galápagos. We left the beach to don our snorkel gear in preparation for viewing the marine life below the water. Our guides directed us onto pangas and took us to a rocky area just offshore. 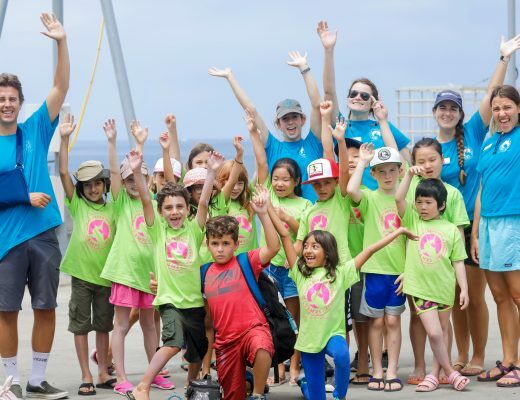 We quickly dove into the water to see the incredible marine life below, including large schools of angelfish, sea turtles, triggerfish, rays, urchin, and even a white-tipped reef shark! Some of the more bold sea lions even cavorted around a few members of our group. Later in the day, we embarked on a hike, heading deeper into the island’s flora and fauna. We first encountered hundreds of marine iguanas warming themselves on the rocks in the afternoon sun. We then spent hours photographing and cataloguing the many different species endemic or native to the island. From Darwin’s finches to blue footed boobies, the beauty of this island stuns us all. We spent several hours hiking along volcanic rock seeing the albatross and their “ugly” babies, as our guide explained. We even saw several take off! They are too heavy to take off directly on land and need to literally jump off a cliff in order to become airborne. 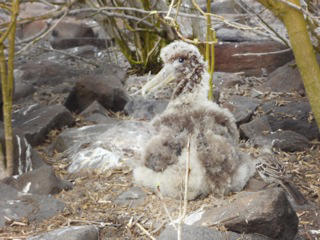 Baby albatross on Española Island in the Galápagos. Back at the beach near sunset, we came across a recent sea lion birth. Mother and baby were resting comfortably on the cooling beach. Another mother laid nearby on her back getting ready to give birth. Interspersed throughout the sea lions are iguanas and birds, all resting together without fear. The day was capped off by a stunning sunset. We even saw a green flash! Today was truly a day for memories that will last a lifetime. Congrats to Dr. Hillgarth, who was recognized by San Diego Magazine last week as one of six San Diego “Woman of the Year” finalists. Wonderful write up and photos! What a beautiful place! It was the trip of a lifetime! I enjoy reading your recollections as I work on organizing my photos. Thanks again!